The one thousandth tree has been registered on the TreeWatch website, reflecting increasing interest in our citizen science initiative. 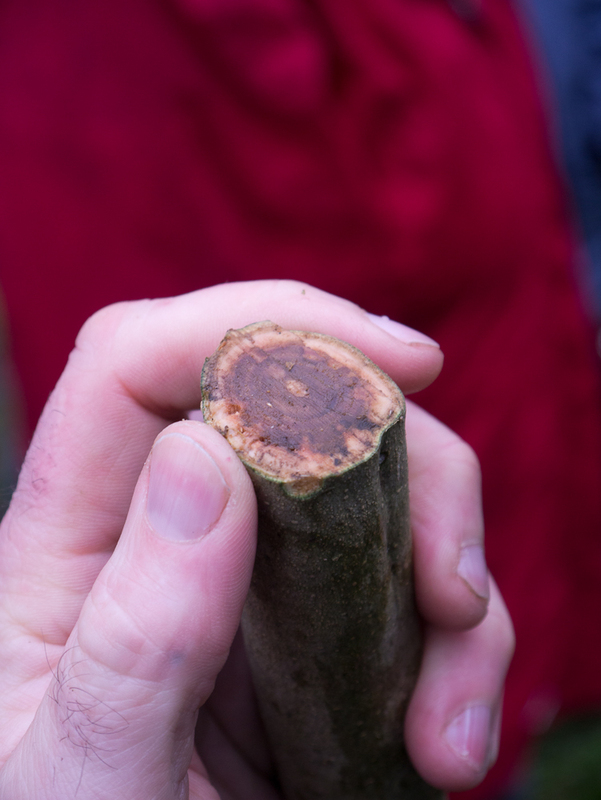 It comes the same month as the devastating new disease on ash, Chalara fraxinea or ash dieback, finally attracted the national media attention it deserved, and the same year that sweet chestnut blight and the Asian longhorn beetle were reported in the UK. These diseases and pests are added to a growing number of existing health issues affecting our trees including acute oak decline in oak, Phytopthora ramorum in larch, the oak processionary moth and more besides. The age of the citizen scientist is certainly of the moment, as a growing army of volunteers capable of sighting and reporting tree health issues, can be a very powerful weapon in our defense of trees especially when working alongside tree professionals and scientists. This is the role of the TreeWatch initiative. As our slogan for TreeWatch reads … people power for healthy trees! UPDATE: ash dieback was confirmed today to be present in two woodlands in the East of England. These are the first confirmed cases of the fungal pathogen outside tree nurseries. 25th October 2012. 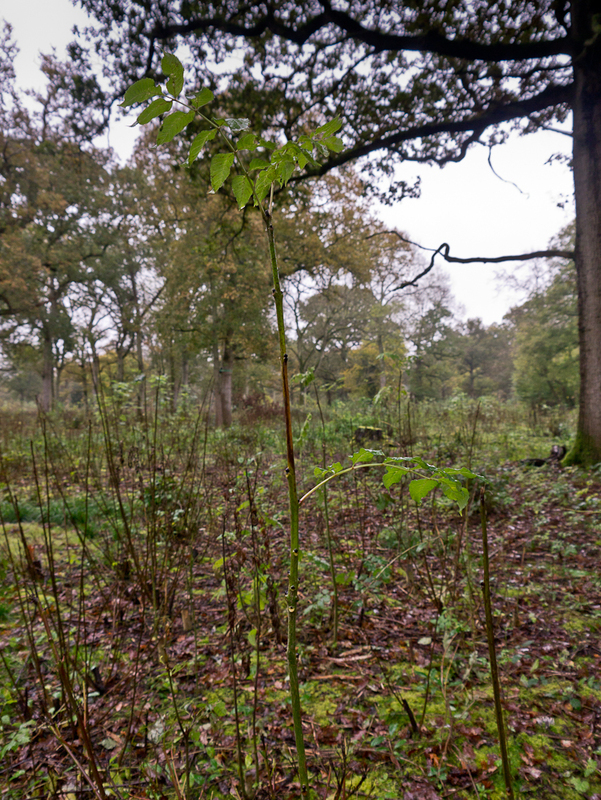 A devastating new disease affecting ash trees is now present in Britain. 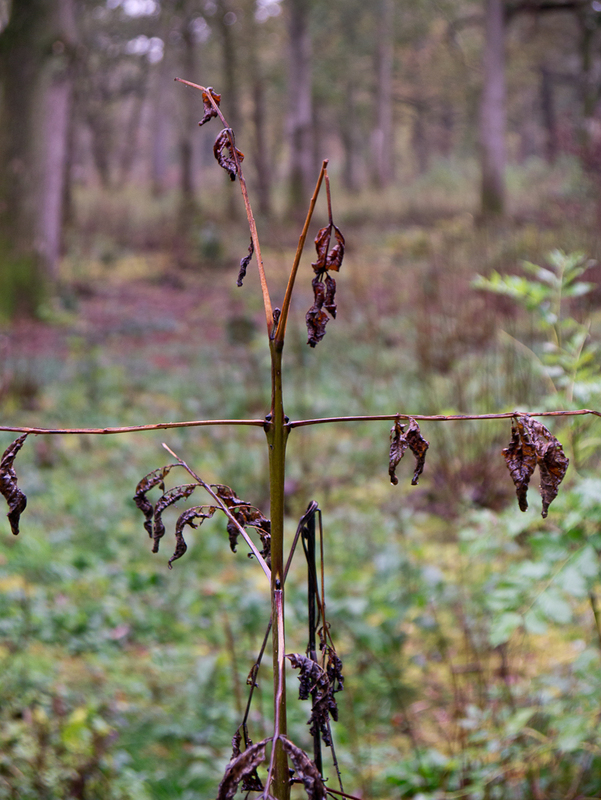 A fungus called Chalara fraxinea (C. fraxinea) causes leaf loss and crown dieback in affected trees, and it can lead to tree death. It has devastated 90% of ash trees in Denmark, leading to concerns that the disease could have a similar impact on the British landscape as Dutch elm disease. It is likely that Defra will implement an import ban by November after calls from across the forestry sector. 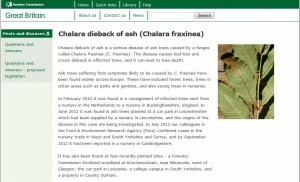 Ash trees suffering from symptoms likely to be caused by C. fraxinea have been found widely across Europe over the last 10 years. These have included forest trees, trees in urban areas such as parks and gardens, and also young trees in nurseries. 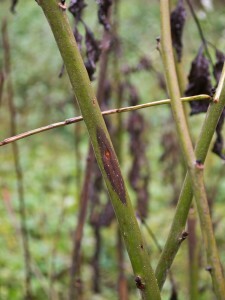 Symptoms include the wilting of leaves and dieback. During the dormant winter period it can be hard to spot but black lessions on stems are tell-tale warning signs. 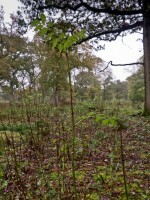 It was first reported in the UK in February 2012 after it was found in a consignment of infected trees sent from a nursery in the Netherlands. Over the Summer new cases were soon reported first in central England and soon after the north and east. 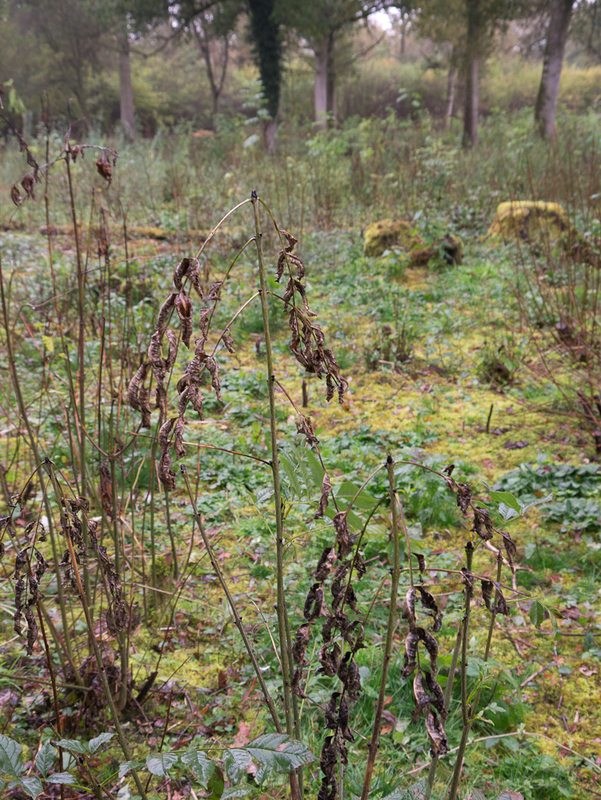 It has been found also in four recently planted sites in Scotland. C. fraxinea is being treated as a quarantine pest under national emergency measures, and it is important that suspected cases of the disease are reported. Visit the Forestry Commission webpage to find out more. 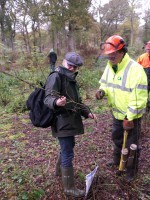 It’s not too late to take part in the 2012 TreeWatch surveys. Whether you are an existing volunteer or have just come across our exciting citizen science project, take part in one of our surveys. Please take part and help us share crucial tree health data with our scientific partners. Why not get a friend to take part too and help us reach our goal of 1000 trees adopted this year? Your tree(s) should appear on the right of the map. Click on it’s name. This will bring up below the information you need to update its status. Sylva has teamed up with the UK’s leading gardening charity, the Royal Horticultural Society, to launch the 2012 pear rust survey under our TreeWatch initiative. The Royal Horticultural Society (RHS) is working with the Sylva Foundation to run a survey in the TreeWatch initiative to map the incidences of European pear rust across the country. Over the last ten years the RHS Advisory Service has seen a steady increase in enquiries suggesting that the fungus is spreading and gardeners are becoming more concerned about its effects. Both charities are encouraging gardeners to get involved with this survey which is being run between May and September. Anyone wanting to help or provide information can visit: www.TreeWatch.com/pearrust or send samples to the RHS Advisory Service. This week we have launched two new surveys at TreeWatch. Both relate to the health of our oak trees and we asking members of the public for their help. Both surveys have been developed jointly with scientists from Forest Research and we will be sharing the scientific data we collect them to help in their studies. Both surveys, the oak jewel beetle and powdery mildew, have been linked to the very serious problem affecting our oak trees:- Acute Oak Decline. 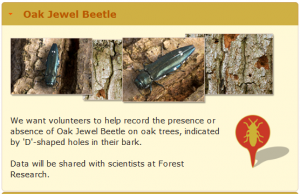 The oak jewel beetle Agrilus biguttatus, lays its eggs in crevices on the bark of native oak trees. The larvae that hatch then tunnel through the bark to feed on the tree tissues underneath the bark. If large numbers of this insect infest a tree it may lead to tree death. When the larvae pupate, the emerging young adult beetles make very characteristic ‘D’-shaped exit holes. Scientists at Forest Research want to know more about the distribution of this beetle, so it is just as important that your report an absence as much as a presence! 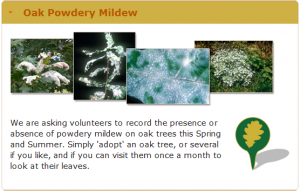 The second new survey is on Oak powdery mildewsurvey. Powdery mildew of oak is caused by the fungus Erysiphe alphitoides (also known as Microsphaera alphitoides) and it is a common foliar pathogen of oak trees across Europe. First found in England in 1908, it is thought to have been a factor in an oak dieback episode in the 1920s. Scientists today believe that it may one of the factors that is contributing to the decline of our oak trees. The mildew attacks young leaves and soft shoots of oaks, covering them with a felty-white mycelium (fine white threads). It causes eventually the leaves to shrivel and dry out or turn brown. 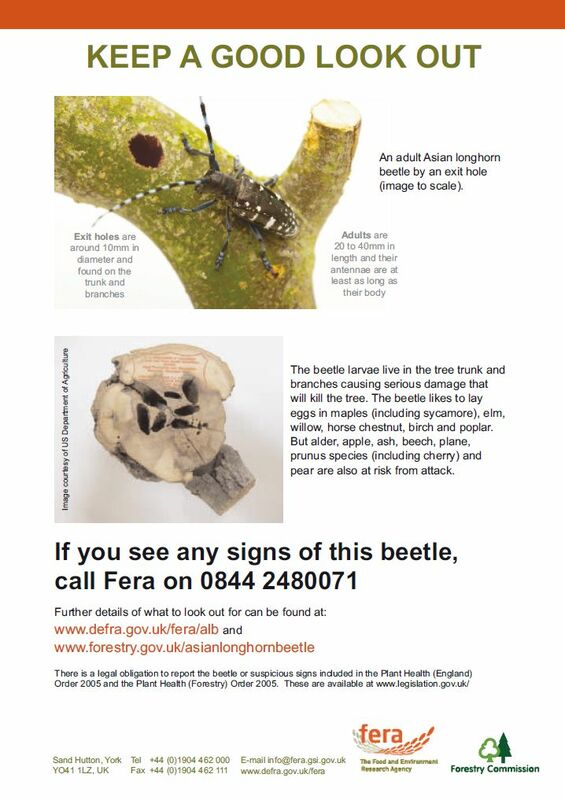 Forest Research and the Food & Environment Research Agency (Fera) are working to eradicate a breeding population of Asian longhorn beetle found in the Paddock Wood area of Maidstone in Kent. The Asian longhorn beetle, native to China, poses a serious threat to a wide range of broadleaved trees. It has caused extensive damage to trees in the USA and Italy since being accidentally introduced there in recent years. The existence of this population was confirmed first by Forest Research scientists in March.Today it was confirmed the larvae (grubs) of Asian longhorn beetle were found on 22 trees in the area and five more are considered highly likely to be infested. The infestation zone (i.e. the area within a 100m radius of each infested tree) currently covers about 8 hectares (20 acres or 80,000m2). Asian longhorn beetles can infest a wide range of broadleaved trees and shrubs. The larvae feed undetected on the inside of the host tree or shrub, which could kill it or leave it weakened and susceptible to further pest and disease damage. Although the larvae are unlikely to emerge as adult beetles before the end of June in the UK, it is important that we remove all infested and potentially infested trees as early as possible before then. 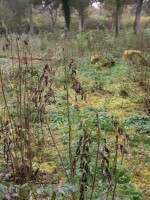 They would be a serious threat to UK woodland if they became established. Find out more on the Forestry Commission’s webpage on the Asian Longhorn beetle. Please note that Fera must be notified of sightings of beetles or other evidence of infestation by ALB, such as exit holes in the trunk of host plants. There is a legal obligation to report the beetle or suspicious signs included in the Plant Health (England) Order 2005 and the Plant Health (Forestry) Order 2005.